Happy Baba's day to you. Your first visit is on our Baba's day. This gives me an good sign. will make wonders in your life. We will all pray for your well being. SAI bless you and your wife always. Be happy and have faith in our Baba Sai. You will find the differance. Your happy days are almost here. Thank you for praying...I quite glad there are people who really care for others...thank you once again...my sincere blessing to you always and may you too lead a happy life. DEAR BROTHER PALAJI. WELCOME TO THIS MANDIR(TEMPLE). DO NOT WORRY AT ALL.I ASSURE YOU THAT YOU WILL DEFINITELY FIND PEACE HERE. PLEASE HAVE FAITH IN BABA. WE WILL ALL PRAY FOR YOUR HAPPINESS. PLEASE BABA GIVE PEACE OF MIND AND HAPPINESS TO PALAJI. OM SAI SRI SAI NAMO NAMO SAI. OM SRI SACHIDANANDA SATHGURU SAUNATH MAHARAJ KI JAI. WE LOVE YOU BABA. THANK YOU BABA. Om Sai Ram....Om Sai Ram....Om Sai Ram ! Baba bless you dear brother Pala, Have great Baba's day. Welcome to beautiful Sai Mandir. Bless your child with love and peace in his life. Welcome to this awesome online mandir conceived by our awesome brother Ravi with the blessings of our dearest Babaji.This online mandir gives love, hope, assurance,happiness etc.Baba's presence is felt here by many and you would also experience the abundance of our dearest Babaji.We sincerely pray that Babaji dwell in your wife's heart so that she starts thinking right. Belated welcome, dear Pala, to this blessed online SAI Mandir by our dear Ravi Bhai. SAI led you here to give you peace of mind and heart. Cast your burden unto HIM - as you have already done with your post - and rest assured that SAI will take the best ever care of your marriage, your wife's feeling of unworthiness and your aching heart. May you always feel HIS blessings on you. 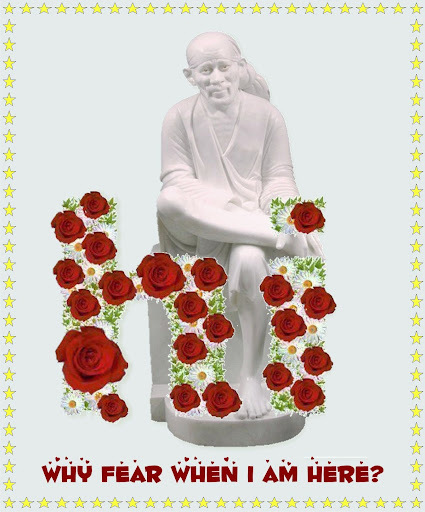 Welcome to this most divine forum of Sai Devotees. You will definetly bliss and peace in this forum. Look into the eyes of Sadguru he will look into your problems. He who has bestowed faith in him has not gone emty handed. Trust me when I say this because I was bestowed with HIS most kindest of the blessings. Today I am ahappy man and I do remember my BABA every day. BABA is always with all his children. Let us all pray together to have peace at your home. Cast your burden on him and he is besides you to take care of your family. I am deeply touched by you all praying for me and my wife. May god bless you all too ! Page created in 0.348 seconds with 67 queries.